Brenda brought a special quilt to our last meeting in January. She made it for Forest, the service dog belonging to one of the veterans who received a Quilt of Valor at our last QOV Ceremony. 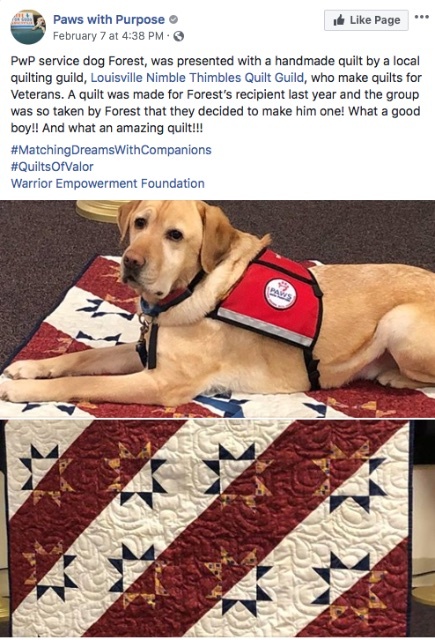 That veteran shared pictures of Forest and the quilt with Paws with Purpose, who then posted it on their Facebook page, giving credit for the quilt to our guild. The credit actually belongs to Brenda who had the vision of appreciation not only for the veterans, but the many service dogs who provide needed assistance. We are all thankful for our veterans. And we are all thankful for organizations like Paws with Purpose who provide Assistance Dogs as partners to children and adults with physical disabilities or other special needs, including many veterans.